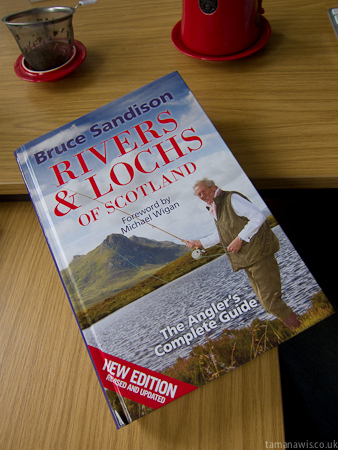 The rivers, the lochs…all of them..
Well I finally got around to ordering Bruce Sandison’s essential guide to the rivers and lochs of Scotland. It arrived this morning and it certainly looks like a very handsome refresh of the last edition, complete with a smattering of nice pictures and updated/new details for many waters. My opinion (which many others seem to share) is that it’s basically essential for anyone fishing in Scotland, be it regularly as I do, or for a holiday. I bought it direct from Bruce, which meant he kindly signed it with a short quotation from Norman MacCaig as I requested. More details over on the (excellent) Wild Fishing Scotland web forum. If you prefer Amazon, it’s for sale here as well. My favourite comment about the (original) book comes from Bruce’s son, who called it “the finest work of angling fiction ever written”. All in good humour, of course. This week’s book of the week on Radio 4 is a serialisation of Luke Jennings’ writings on a lifetime of fishing. Today it’s about fly fishing. A very enjoyable listen, you can catch up on all episodes by clicking here. I’m currently reading a book called Fishing in Wild Places, by David Street. 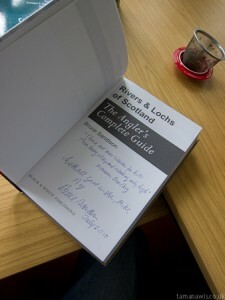 It’s a collection of 12 essays based around fishing, gathered together from a lifetime of fly angling and writing. Although I’m only part of the way through it, I thought it nice to give an advance mention of the upcoming review by quoting one of my favourite passages so far. It comes from chapter 5, where he embarks on a two week expedition to fish for sea-trout in the windswept Faroe islands of the north Atlantic. It was then that I had a take from something more like what I was looking for, and after a strenuous contest I netted a fine sea-trout of 3lb to the Bloody Butcher. Perseverence was rewarded, and my first Faroese sea-trout came against all the odds; a fisherman is sustained in the knowledge that the unexpected is only a few casts away. Let him believe this and he will endure almost anything. Via the Moldy Chum blog, I came across an article about the upcoming River Why film this morning. It draws attention to one or two interesting things of which I was not previously aware. Most importantly, David James Duncan, the author of the original (and wonderful) book, has done as much as he can to halt the film’s production. Amber Heard, star of the upcoming River Why film. Hmm..excellent casting I’d say. According to the article, he has been to court, claiming copyright infringement and various other bits and bobs, which has resulted in the current production of the film being unable to use his name in promoting the film. I say ‘current production’ because the article goes on to say that once the upcoming film has been released, Duncan will once again own the rights to his own book, and is planning to make his own screen version. Hmm…. all a bit dodgy I reckon. In an earlier post I mentioned that Duncan had been contributing to the screenplay. A commenter on that post pointed out that the film would be quite different to the book (er, not a huge surprise..). I now learn that Duncan has been fighting the film.. Personally, I’m a bit confused. But looking at the Official Website for the new film, I see no mention of Duncan at all. I don’t like being overly negative towards people who are trying to produce a film, or make music, or do anything creative. But I do begin to struggle a little bit when it appears that a film is being made, not just with a shrug of the shoulders from the author, but with a pitched court battle between him and the producers. I wouldn’t give a damn, of course, if it wasn’t for the fact that it was David James Duncan who created the story, the characters, the beautiful mood of the book. It’s his novel, and although I’m fully aware that copyright law is more complicated than my simplistic standpoint, I simply don’t feel comfortable about a film that doesn’t have the author’s backing. Amber Heard, however, I feel quite comfortable about. Sometimes you read a book which reaches far inside your soul and carves out a lasting place. Reading Mountaineering in Scotland is one of those wonderful, exciting and extremely humbling experiences that can’t help but enliven one’s spirit as to the worth of life. A bit like some of the passages which describe fishing in Chris Yates’s book, How to Fish, you’re left with the strongest feeling that it would be impossible for anyone to ever write words to better express the beauty of mountaineering. Tonight’s passage comes from Murray’s final climb on the Beauchille in 1941, before he went off to Egypt for the war years. It’s impossible to read the account without imagining the tinge of sadness that must have accompanied him as he climbed, in the full knowledge that he might never return to Scotland. He did of course, and went on to write many of the accounts described in Undiscovered Scotland. The mountain looked like a fortress of ice, its summit diamond cut deep into a royal blue sky. It was this last that held us there. It was not along the confusion of snow-turret and bastions, nor even the ridges racing up and up, drawing in to the white blaze where the last rocks leaped against the blue; not grace of design, nor colour, nor height – none of these things alone – that charged our minds with wonder. These beauties were indeed endless, but were brought to unity and fulfilled in that austere and remote line dividing snow from sky. It was the signature of all things. It held us spellbound. It is hard to know why, until we know that it is the most simple things that most deeply impress a man. Until we know that we shall not hope to know the true beauty. Up there, nothing stirred. Not even ‘the sigh that silence heaves’; only a breathless stillness. A bright light. A pureness of beauty above all that the eye can see, or ear hear, or it can enter into the heart of man to conceive. One may say nothing of it that is not somehow false or misleading. For the truth that can be spoken is not the truth. Yet on the heights of truth one never climbs in vain.